A peculiar Copernicus-related memorial, referring to the 8th page of his major work "De Revolutionibus Orbium Coelestium" and modeled on his heliocentric system is the Cosmopolis Fountain on the commons behind the Harmonica building. The fountain consists of 113 water nozzles, located on the orbits of Mercury, Venus, Earth, Mars, Jupiter and Saturn. The water stream ejected from the central nozzle, symbolizing the Sun, reaches the height of 5 m, while those of the orbit nozzles – 4.5m. In the tourist season, the fountain is electronically programmed to present the light and sound show 3 times after dark (in April at 8, 8.30 and 9 p.m.). Tourists and the residents have the opportunity to hear Krzesimir Dębski’s record entitled "Cosmopolis", which lasts 15.5 min. It was recorded by Toruń Symphonic Orchestra musician and Astrolabium Choir of the Higher School of Banking. The music reminds of Toruń’s rich history and Nicolaus Copernicus says Krzesimir Dębski. For a moment I had a feeling that there were plenty of pretexts to compose music in Toruń and thus I employed medieval motifs to suit the Gothic architecture of the city. They are, however, combined with modern music and there are a number of astronomic and mathematic references in certain musical phrases. There is also some reference to musical visions of Tales of z Miletus and Pythagoras. It is important to know that they contributed to our musical system as well. 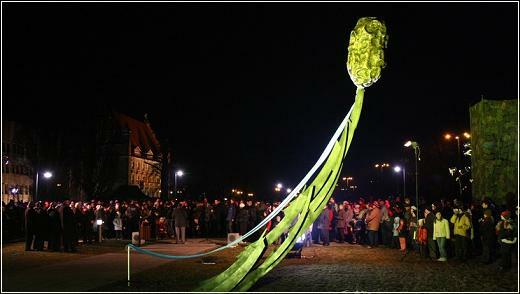 In the neighborhood of Cosmopolis fountain the installation in the form of aluminum orbit with the asteroid "Toruń" (No. 12999) placed on it was unveiled on the day of nationwide celebrations of International Year of Astronomy, 19 02. 2009. Circulating between Mars and Jupiter asteroid was discovered in the sky on 30 August 1981 by famous American astronomer Edward (Ted) Bowell, who has discovered nearly 600 similar objects. On the request of Professor Bowell (and only a discoverer has the right to) it obtained the name "Toruń" on the decision of the International Astronomical Union. The asteroid revolves around the sun in a slightly elliptical orbit in 3 years 156 days and 23 hours. It is a stone of the size of several kilometres, which visible from a distance of 1 astronomical unit (distance from the Earth-Sun) would have a brightness of 14m, which would be more than 60,000 times weaker than the North Star.